Matthew McConaughey is on a roll right now, as he's been picking projects both prestigious and profitable over the past couple of years. With Interstellar behind him and The Sea Of Trees ahead for some time this year, the Academy Award-winner also already has a film lined up for next March – and today we have our first look. 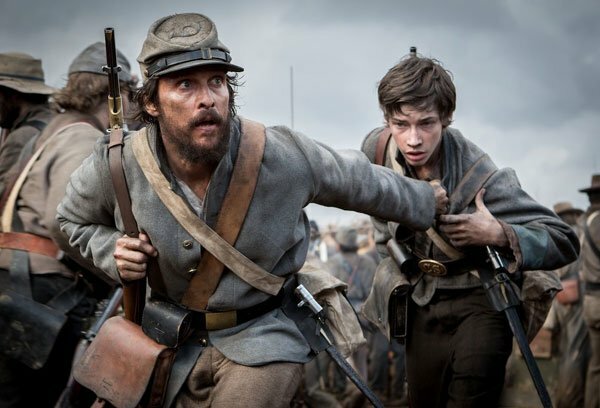 Judging by this still from The Free State Of Jones, it looks like it could be the continuation of the streak that the we've come to know as, "the McConaissance." STX Entertainment officially released the still you see above, as well as plot details about the Gary Ross-directed historical adaptation, which puts McConaughey into the role of real life deserter Newton Knight. A man of principle, he leaves the Confederate army with his entire company – retiring to his home in Jones County and declaring themselves seceded from the Confederacy. This upset the Confederate brass not only due to its defiance, but also due to its formation of a mixed race community. Rounding out the cast of The Free State Of Jones is The Americans' Keri Russell, as Newton's wife, Serena; as well as Belle's Gugu Mbatha-Raw as Newton's lover and eventual second wife, Rachel. Both women know their way around historical period pieces, and both sound like they'll be an absolute delight to see paired off with Matthew McConaughey. What's interesting about The Free State Of Jones is the fact that it's one of those historical films that tells a story that while being a part of history, isn't very well known by a lot of people. It's easy to make another movie about Abraham Lincoln and the battle of Gettysburg, but blazing a historical trail in the film industry is something that can easily be saluted. However, it could also very easily be feared, as one wrong detail or one false note could send the whole film back to being ranked as an amateur in a business that sadly tends to favor familiarity over uniqueness. That is, if anyone sees The Free State Of Jones, considering it's being released at a rather inopportune time. The March 2016 release date is a little bit of a troubling sign for The Free State Of Jones, particularly with its lack of a major studio backing it for distribution thus far and Batman v Superman: Dawn Of Justice opening a week and a half after it. Unless it’s really great, this flick could be forgotten as quickly as it's released. But another factor to keep in mind is the fact that Gary Ross' last directorial effort, The Hunger Games, also found itself released in an off season release date with a similarly modest budget. For now, The Free State Of Jones looks to take aim at history on March 16th, 2016.